August is Pet Dental Health Month and all throughout the month we’ve got your beloved pet in the dental chair to help share some useful tips on maintaining good oral health. Neglecting to give your cat or dog adequate dental care can have serious health implications related to their heart, liver and kidney. Knowing what’s going on in your pet’s mouth through regular checks and vet appointments can save your pet a great deal of pain. And, it can also save you financially in the long run. Often the most obvious sign of dental disease is from your cat or dog’s breath. Don’t expect to smell a field of flowers but if you notice an especially offensive odour, we advise that you consult your vet. Regularly checking your cat or dog’s mouth by lifting their lips to reveal their gums and teeth will help keep tabs on their oral health. The gums should be pink, not white or red, should show no signs of swelling and their teeth should be clean, without any brownish tartar. This can be done once a week and you should get your pet accustomed to you handling their mouth as early as possible, starting from when they first come home. • Familiarise your pet with the idea of getting their teeth brushed by massaging their lips with your finger in circular motions for up to 60 seconds once or twice a day, then do the same with their teeth or gums. • Once your pet is accustomed to the sensation of brushing, put some pet-formulated toothpaste on their lips to get them used to the taste. • Slowly introduce your cat or dog to the pet toothbrush! Simply apply toothpaste to the brush and gently brush their teeth in a circular motion, making sure to reach every tooth. We recommend you speak with your vet about a specific method that is best suited to your pet and their age. A veterinary examination prior to brushing your pet’s teeth will also help gauge whether your cat or dog has existing oral health issues that may make the brushing experience uncomfortable. For example, your dog or cat may have mild gingivitis and brushing too hard can hurt his or her gums. A good diet is essential and should be started as early as possible. Make available a range of treats to chew on like tendons, cartilage or bones (never give your pet cooked bones and ensure that they are the right size for your pet). There are also non-animal origin dental products available including specially designed oral health chew toys. For further information or a specially formulated dry food that can slow down the formation of plaque and tartar, please contact your vet. 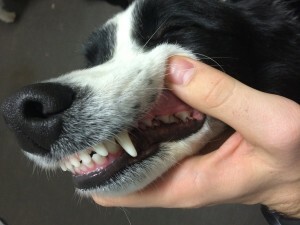 Listen to Dr Alan Bolton, senior veterinarian The Lost Dogs’ Home Frank Samways Veterinary Clinic shed light on common dental disorders among cats and dogs.Dr Alan talks Oral Diseases – Listen Now! A dental check does not take too much time and can be done as part of your pet’s annual health check. Book it in now if you haven’t already with your vet or contact The Lost Dogs’ Home Frank Samways Veterinary Clinic on 9329 2755. For all you need to know on pet dental health, check out our Dental Health Special Pets-A-Loud podcast now. Next week: Did you know The Lost Dogs’ Home provides vital minor and major dental to stray cats and dogs? We hear more on the veterinary care that goes into preparing our strays for adoption.